Starbucks has a strong brand name, synonymous with quality, customer service and a unique atmosphere at its stores. The company gains from benefits of scale as it expands its retail store footprint globally. While the US market is close to being saturated in terms of store count, there is plenty of room for growth in countries like China, India, Brazil. The international expansion can be aided by replicating the best practices of stores in the US and then replicating success abroad, one store at a time. The company can also squeeze in more growth from existing US stores by adding more food items to the menu, while also adding drive-through windows, and extending store hours. Innovation on the digital front, where customers can order on the mobile phones and go, could further boost revenues. In addition, the company has licensed its name to be used for products distributed in grocery stores around the world. This is another revenue stream to capitalize on its strong brand name. Nestle is paying Starbucks Corp $7.15 billion in cash for exclusive rights to sell the U.S. chain’s packaged coffees and teas around the world, tying a premium brand to Nestle’s distribution system. In addition, Starbucks will receive royalties on each products sold. This allows Starbucks to focus on its stores, rather than the consumer packaging segment. The benefits to scale relative to other coffee shops are adding to the company's bottom line. In addition, the strong brand and unique customer experience have translated into pricing power for Starbucks. The company would likely be able to grow its store count closer to 37,000 units globally by 2021 by opening roughly 2,300 stores per year. China is a key driver for future store growth, with the company expecting to double the number of stores to 6,000 by 2022. The total number of locations as of Q3 2018 is 28720 stores in 77 countries. Starbucks is also targeting mid-single digit same-store sales growth as well. It is also targeting annual net revenue growth in the high single digits. As a result of store count increases and estimated increases in same store sales, it is quite possible that the company will be able to grow earnings per share of 12%/year or greater over the next decade. As we mentioned above, Starbucks initiated its first ever dividend payment in 2010. Since then, it has managed to boost that dividend by 520%. 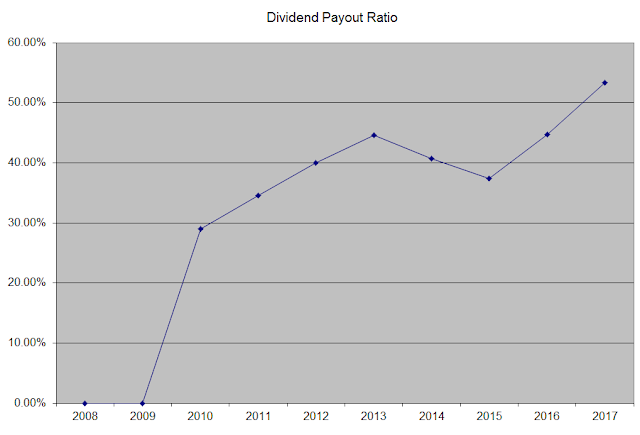 This was possible because the dividend came from a low base, and the company managed to increase the payout ratio, while also growing the earnings per share. I believe that future dividend growth will be closely tracking earnings per share growth. The dividend payout ratio increased steadily from 29% in 2010 to 53% in 2017. Using the forward dividend and forward earnings, I come up with a forward dividend payout ratio of 60%. I find that Starbucks’ dividend payout ratio is high, which is why I do not believe that future dividend growth will be able to exceed earnings per share over the next decade. 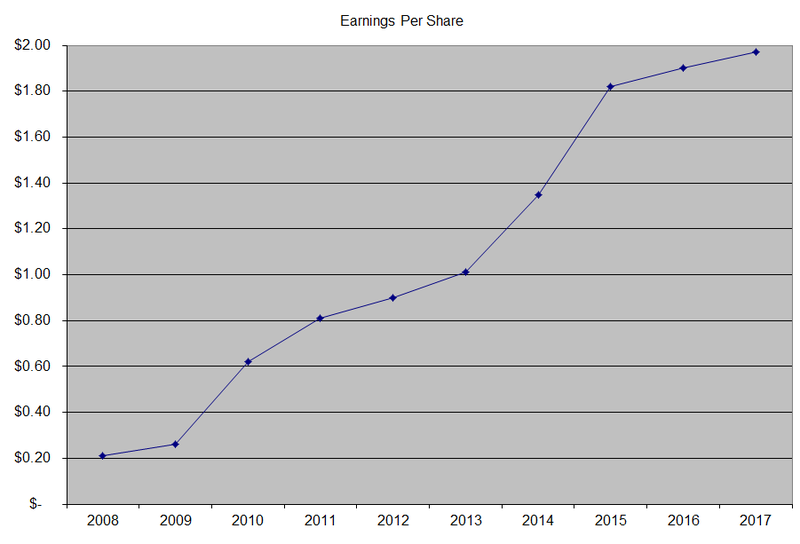 Right now Starbucks is slightly overvalued at 21.40 times forward earnings. The stock does yield an attractive 2.80% and has a sustainable dividend for now. I like the company, but for whatever reason it has always been selling for more than 20 times earnings. I do have discipline to wait however, and not get carried away chasing growth at any price. I would be interested in the stock if it dips below $48/share.